Thread: March 31, 2019: Please, Think Of The Hungry Dragons! March 31, 2019: Please, Think Of The Hungry Dragons! It's always a great time to gather and socialize .*.*. and dragons would love to have you over for dinner! 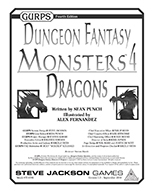 Life as a GURPS Dungeon Fantasy hero just became more dangerous, with the release of GURPS Dungeon Fantasy Monsters 4: Dragons. GURPS Dungeon Fantasy architect Sean Punch reveals the horrifying truth behind these scaly, scary slayers. (Spoiler alert: They're really dangerous.) You'll discover the basics of dragons, from adolescent ankle-biters (torso-biters?) to gargantuan molten-spewing murder machines intent on protecting their hoards. Oh, and they can get even bigger. This supplement also includes a detailed look at dragon's breath, with new options and opportunities to turn parties into p&acirc;té. It then examines other abilities to make each encounter with these deadly dungeon denizens unique, and details their tricks and tactics to create frantic fights. Finally, it provides four ready-to-go sample dragons, perfect to unleash at a moment's notice. With GURPS Dungeon Fantasy Monsters 4: Dragons, we're putting the "IEEEEEE!!!!" back in GURPS Dungeon Fantasy. Download it today from Warehouse 23! Warehouse 23 News: A Little Sparkle For You! You can never have too much sparkle! *On the other hand, WE have a little too much, so we're sharing it! The Munchkin Sparkle Dice Pack contains four 14mm deep amber sparkly dice and four 19mm pink sparkly dice. They each have the Munchkin head for the one pip and can be used to add some Munchkin flair to any game that calls for a d6. Order today on Warehouse 23!